well when you put it in perspective like that, i sort of understand what all the fuss was about. 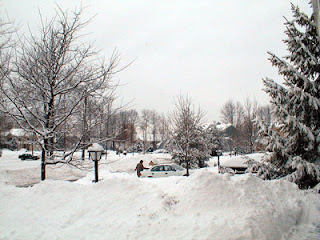 when i left the uk (27 yrs ago) we were getting snow regularly every winter, but not loads of it. we coped but it was a struggle. of course here in canada we are used to being UP TO OUR EYES IN IT. oh sorry, was i shouting? it's just been a LONG, cold, and did i mention snowy winter and the snow plow just went down the street and plowed me in AGAIN. off to kill wiarton willy. Great post. The Ball & Chain is currently in London, and BLOODY LIVID. He landed on Monday, had to get a taxi into the centre, and has been twiddling his thumbs or doing phone calls (which could've been done from here) while everyone figures out how they're going to get into work. My mum in Merseyside is most disappointed as she didn't get any. I told her she can have ours. I'm sick of it. Haven't seen the grass for 3 months & I go snow-blind every time I walk the dog. Don't get me on this subject! Have blogged about it already - having lived in Europe for a number of years I find the way the Brits deal with snow quite exasperating! I bought myself a set of snow tyres in December and feel suitably smug at the moment as the only one who is grinding happily up and down our snowy, icy lane without incident (I'm even beating the 4-wheel drive LandRovers at their own game!). Uh-huh, I took responsibility and I feel like the cat who got the cream (apart from the fact I have NO excuse to take a 'snow day' - and my children are pissed off that I keep getting them to the school bus!). PS: Was born in Hurstpierpoint and from 7 grew up in Haywards Heath and went to secondary school in Burgess Hill (or Bugs Hole as we used to call it!). Parents still live in Lindfield. Only got sent up to the frozen north 6 years ago - but am still here for some reason. ExpatMum: This is day five of the Great Snowstorm and I understand London is still a good place to not be in. Sorry about the B&C. Pam: I recall the days of walking the dog in -20F and driving to work in a whiteout. Like Clippy, you make me glad I don't live there any more. Thanks! I had the same sentiments about the snow. I was thrilled to see it-especially for the kids. But really--a million dollars wouldn't get me to drive on the roads with all those inexperienced snow drivers in cars without snow tires! What is wrong with a couple of snow days anyway? Isn't that what makes the snow fun? Brit's & Snow do not go! Elizabeth: It was nice getting a snow day; my first in many years. But actually, that just means I worked from home so I didn't get to go out and help the neighbor kids make a snowman. Brit Gal: No they don't! But have a look at my Addendum to see what I'm used to. “Caught with the pants down”… hahaha… Talk about extraordinary weather pattern: Beginning of the week we got more than a foot of snow, it started to rain in the afternoon, and then the whole mush froze over night. I didn’t have to use my car for about a week and yesterday when I wanted to drive away – the tires where stuck in the ice – about 10 cm solid ice all around them. All dressed up and nowhere to go! Fida: I thought you were somewhere sunny!